In Great Lakes tributaries King Salmon, coho, pink and atlantic salmon are all available to fly anglers in Northern Michigan. Hawkins Outfitters guides are equipped to guide anglers for all of these species in late summer through fall. The majority of our King and Coho salmon fishing is done on the Manistee River below Tippy Dam down to the mouth of the river. Secondly on the Betsie River, in the lower stretches and finally on the Pere Marquette River. Tippy Dam is the upstream barrier to the King and Coho Salmon migration on the Manistee. Since there are no barriers on the Betsie and Pere Marquette Rivers the fish can make it to the headwaters. In late July and early August King salmon usually start moving into the Manistee, Pere Marquette and Betsie Rivers. At that time they can be hooked using a variety of large, flashy streamers. These flies were developed specifically for Kings and Cohos. Fresh from Lake Michigan, these fish are full of energy and still on the prowl. Therefore they can be willing to take a stripped fly. Ultra fresh kings are a handful when hooked. In addition to being big and mean, they can be hard to land. Eight to ten weight rods and stout leaders are the rule. Due to the freshness of the fish this is when fishing for Kings below Tippy Dam on the Manistee River is at it’s best. Kings that have moved upstream begin to think about spawning. Their color darkens. They begin to lose the aggressiveness that they exhibited earlier. Due to their size, even though they begin to weaken because of the rigors of spawning, King salmon still put up a tremendous fight. As they begin to spawn the probability of hooking them on streamers lessens and nymphs and eggs come into play. When the spawn gets going the majority of the fish are concentrated in the first couple of miles below Tippy Dam on the Manistee River. On the Pere Marquette and Betsie Rivers they concentrate near the larger gravel areas. By early September the spawn is in full swing. By mid-October the spawn is about complete and steelhead start to become our main focus. Starting in October we begin to see the arrival of Coho Salmon. They are a much more aggressive feeder than King salmon. Consequently we will target Cohos with stripped flies similar to what we use for trout and fish them normally through November. To sum it up fishing for kings on the lower Manistee River below Tippy Dam is fantastic. Early in the run they are tackle busting monsters, as the spawn begins they are a great way to introduce anglers to fly fishing for big fish. Atlantic Salmon are available to fly anglers in the AuSable River below Foote Dam in fall as well. Atlantic usual show up later with October and November being prime time. Hawkins Guide, Steve Pels goes into more details of timing, location, tackle and flies needed to successfully catch Atlantic Salmon in the AuSable River . 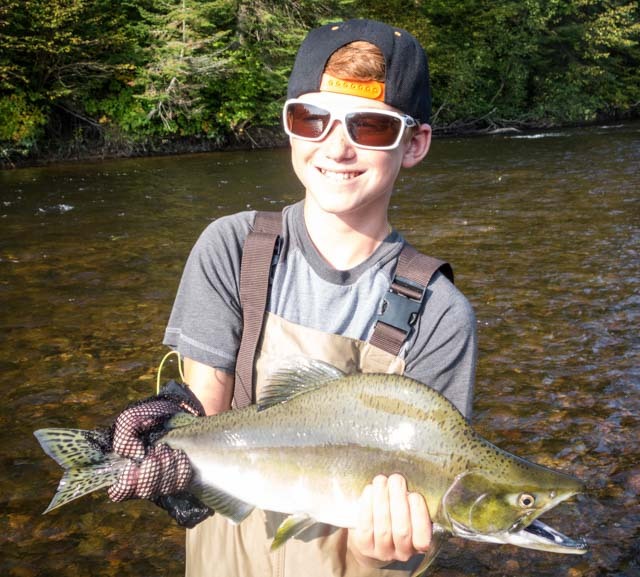 Hawkins Outfitters pursues Pink Salmon on the Garden River near Sault St Marie, Canada. Pinks average about 2 1/2 pounds but can range from 1 to 5 pounds. These salmon are an aggressive fish when they are fresh in the river. They will readily take small streamers fished on floating lines or sink tips depending on water depth. Pre spawn fish favor bright offerings of pink, silver, chartreuse, copper etc. A one to two inch fly stripped in front of a school of moving pinks will usually generate a strike. When hooked on a five weight rod they put up a nice fight. Once the pink salmon are in spawning mode smaller nymphs and eggs come into play. Again brighter offerings rule the day. Crystal eggs in pink, orange, chartreuse, and peach are hard to beat. Fish them on a floating line with a strike indicator, you’ll be hooked up often! For twenty years Hawkins Outfitters has had an agreement with the Garden River First Nation to guide anglers on their private water. Pinks, kings, coho and steelhead are all available to Hawkins Outfitters clients in a beautiful, wild and private setting. Join us in September for this unique opportunity. 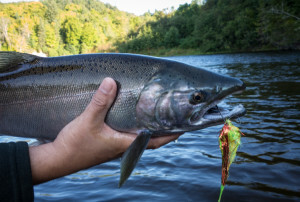 Hawkins Outfitters is uniquely positioned to guide you to success for any of the Pacific or Atlantic salmon species. Due to high demand for these hard fighting beasts available days book early so contact us at 231-228-7135 soon!